Climatologist Cliff Harris has been often rated as one of the top ten climatologists in the world for nearly 4 decades. Cliff Harris' long-range weather forecasts have been used by high-ranking government officials and quoted in USA Today, The Wall Street Journal, New York Times, The Wall Street Digest, Farm Journal, Top Producer, Successful Farming, Futures Magazine, The Boston Globe and many other publications. He also provides several weekly local and national radio weather broadcasts to various stations throughout the country. As one of the partners of Harris-Mann Climatology, Cliff provides daily weather updates to hundreds of subscribers through DTN, Farm Dayta, the Internet and various local media. His weather and commodity forecasting success rate is approximately 75% and he accurately predicted the current prolonged cycle of global weather "extremes" in 1966. Since age 11, he has compiled nearly 100 weather scrapbooks that detail major events throughout the U.S. and the world on a daily basis. Cliff operates a weather station in Coeur d'Alene, Idaho and writes a popular weekly column called 'Gems' for the Coeur d'Alene Press. He has been quoted in CNN and "Not by FIRE, but by ICE" by Robert W. Felix. Cliff and his wife Sharon have been married for over 50 years and have 2 children, 3 grandchildren and 2 toy poodles. 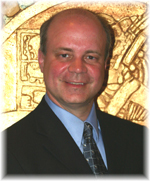 Meteorologist Randy Mann has been recognized by the American Meteorological Society since 1988. He attended the University of California, Davis, San Francisco State University and graduated from California State University, Sacramento. As a partner of Harris-Mann Climatology, he provides some of the daily weather information, computer graphics and maintenance for the company. Randy has also had an extensive background in television and radio weather production, and has provided on-air television and radio weather forecasts in Tacoma, Washington, Sacramento, California, and the Burlington, Vermont/Plattsburgh, New York area. He currently provides occasional on-air weather forecasts for KREM-2 in Spokane, Washington and is currently the Chief Meteorologist for the Coeur d'Alene Press weather page and weekly weather column writer for the Spokesman Review. He currently teaches Physical Geography at North Idaho College in Coeur d'Alene. In the past decade, Randy has also designed other weather-related publications that include two North Idaho weather calendars, the International Traveler's Weather Guide, Tom Loffman's Sacramento Weather Guide, the Vermont Town and Weather Almanac (7 Editions), the award-winning 1997 Frederick County Weather Almanac and the 1998, 1999, Year 2000 and the 2001 Frederick County Weather Almanacs. He has been married to his wife Sally for nearly 25 years.